Offer your parents the convenience of emailed childcare invoices and online childcare payments. Our patented “Smart-Link” technology takes parents to a secure online payment page that already knows who they are and how much they owe. The payment form can be customized with your childcare center’s logo and offer the payment methods you desire, including credit and debit cards, as well as e-check (ACH) payments. 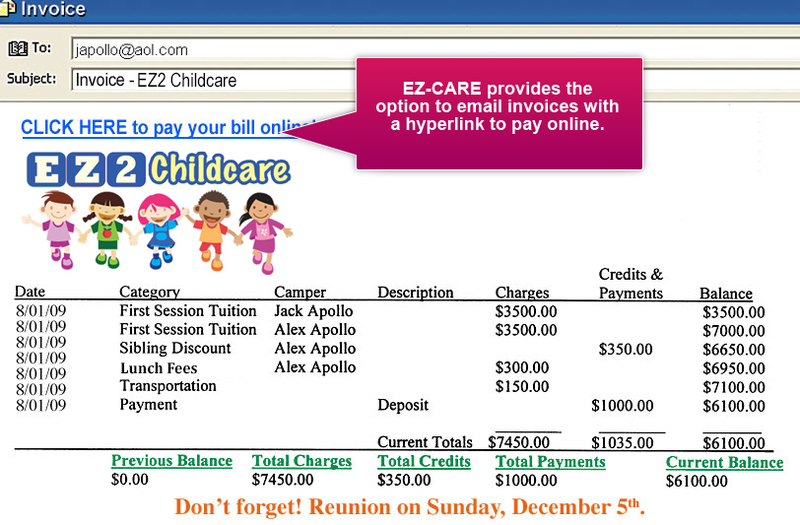 Best of all, payment data easily imports into the appropriate family ledger in your EZ-CARE center management software! FREE with your EZ-CARE2 system! “Smart-link” to secure payment form identifies correct account information and balance due automatically. Payments are immediately processed and automatically deposited into your bank account each night. Transactions import easily into your system – no data entry!